McGraw at his most listless. 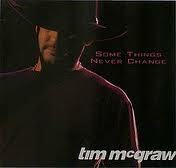 “Some Things Never Change” is an easy listening number that's so easy to listen to, it might put you to sleep. It goes nowhere lyrically or melodically, and there isn't a drum beat or steel guitar hook around to save it. Retro Single Review: Porter Wagoner & Dolly Parton, "If Teardrops Were Pennies"
Is it wrong to have as soft spot for this? I guess I’m a sucker for late 90s country-pop slow songs. Ben said it best – meh. Along with “Watch The Wind Blow By,” this is the most boring hit of Tim’s career. Much like Faith Hill’s “Love Ain’t Like That,” its a song most forget was even a single because it didn’t connect. And it came from a great album, too. Is it wrong to like this? Not at all. It sounds a heck of a lot better than what passes for country music today. But that isn’t enough to elevate it. A catchy song like “Señorita Margarita” or even “The Trouble With Never” would’ve been better single choices.